Convention center renovations set to begin-Construction on the Henry J. The Henry Kaiser Convention Center near Laney College has lain dormant for over 15 years. Orton Development presented plans at Laney College on Mar. 2 for the renovation of the center with plans to reopen the space in early 2021. Drone photos by Michelle Snider. 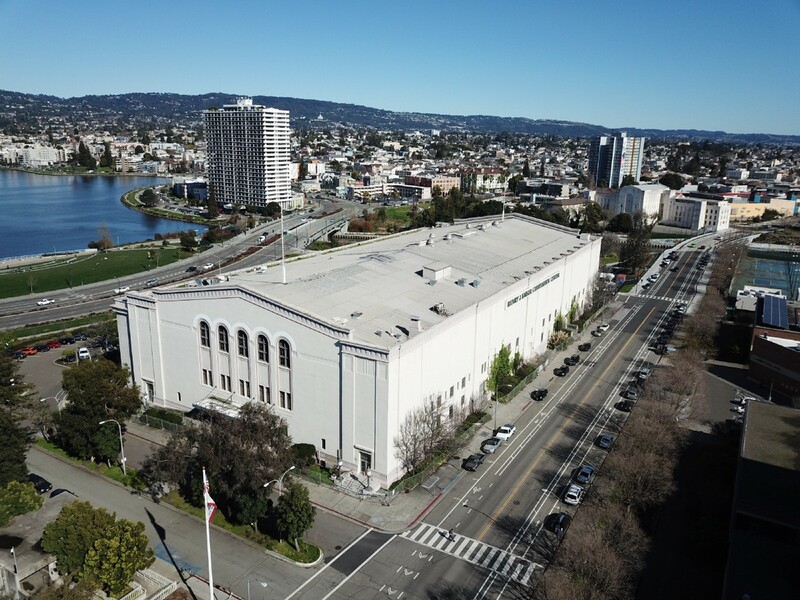 Sitting dormant across the street from Laney College since 2006, the historic Oakland Kaiser Convention Center is the latest property being eyed by local community members advocating accessible and affordable spaces. The Laney Facilities Planning Committee co-hosted a forum with Oakland Councilmember Nikki Fortunato Bas at Laney College on March 2 to discuss the future of the site. Community members told Bas they want to ensure that cultural equity and preservation are important aspects of the redevelopment of the center. Creating jobs, from Laney students to union workers, is also a key aspect to any proposal, she said. Once the project is ready to start, some residents sheltered in the “tough sheds” currently in the parking lot of the center would be displaced. “I am committed to making sure that as we move forward, we are using all of the city’s assets, including public vacant lots, to immediately house folks who are unsheltered,” Bas said. Announcing Laney’s guiding principles for development in proximity to the college, Laney Chemistry Professor and Co-chair of Facilities Planning Committee Dr. Stephen Corlett said redevelopment of any kind near Laney should include shared governing bodies and the college community at large. The preservation and enrichment of diverse cultural community around Laney should also be ensured. Access should be also be adequate, equitable and convenient to the campus, Corlett said. Safety and security impacts are important also, he said. Additionally, Laney should not incur costs, while opportunities should be provided to the students. Emeryville-based Orton Development presented its plan to renovate the center with commitments to maintain the historic design. Keeping costs low enough to provide affordable space to rent to non-profits and artist groups is also a priority. The presentation by David Dial, one of several Orton project managers, showed images of the proposed renovations, which would include public access. The center’s former arenas and the Calvin Simmons Theatre, as well as a restaurant and new exterior deck, would be re-opened for public attendance. 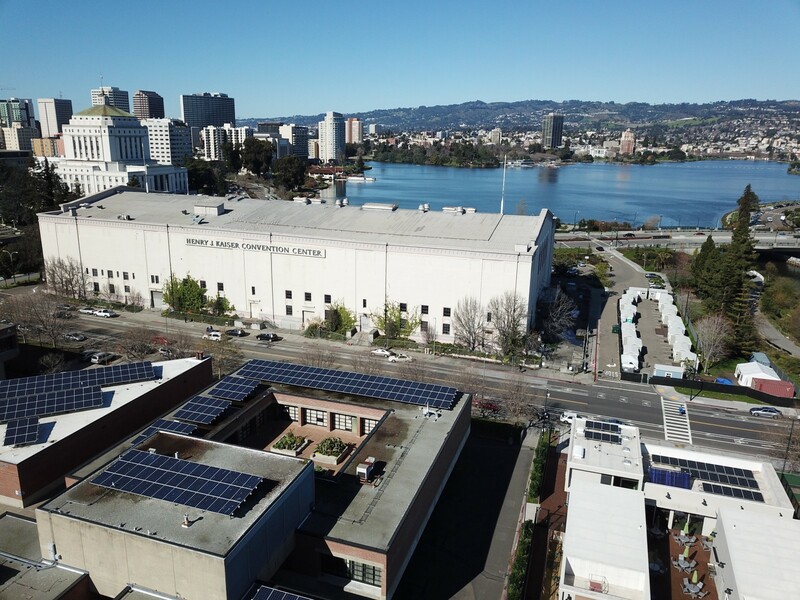 The parking lot and landscape of the Center would include partnerships with neighboring Oakland Museum of California and Laney, and make it easier for people to cross the property to the east side of Lake Merritt. Orton hopes to create neighborhood synergy that will coincide with Lake Merritt and OMCA activities, with new outdoor spaces that can be used for outdoor events. Scheduled public tours to view the historic building will also be available. The project is committed to getting jobs into the neighborhood. According to Dial, Orton is working with stagehand union IATSE local 107, which has a program with students from Berkeley High School to create careers in theatrical arts. The company plans to work with theatrical arts programs at Laney and other local school districts as well. 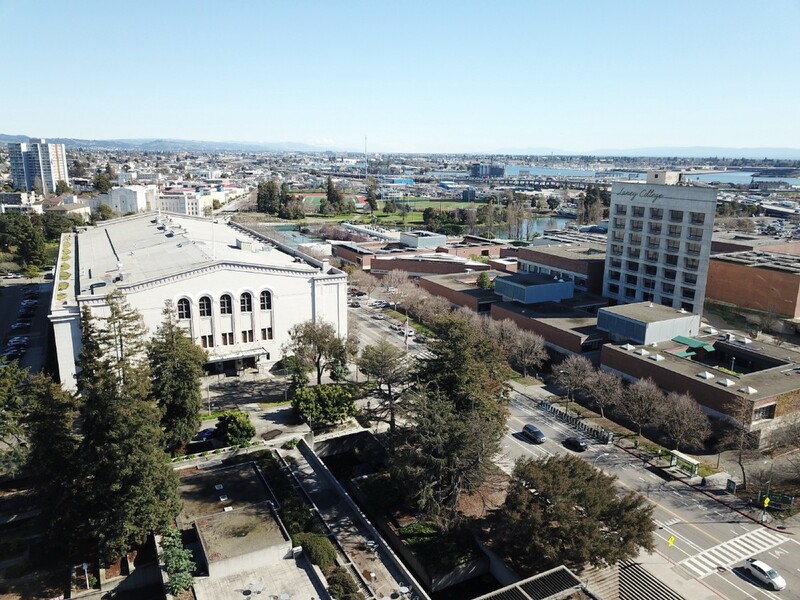 A timeline for the developer’s proposal to go to Oakland City Council in April was presented by another Orton project manager, Carole Bradley, and construction is slated to begin at the end of summer. The grand re-opening of the Calvin Simmons Theatre is scheduled to host its first performance in over 15 years in fall of 2020, and the entire project is should be completed in early 2021. According to KQED News, Dial said Orton anticipates about 500 workstations, accommodating an estimated 10–15 tenant organizations with at least 20 percent of the office space reserved for arts organizations. The plan is to charge different rates to rent ballrooms and theatres. Non-profits are expected to pay half the rate of commercial rentals, while resident companies would get a 10 percent discount on the non-profit price.